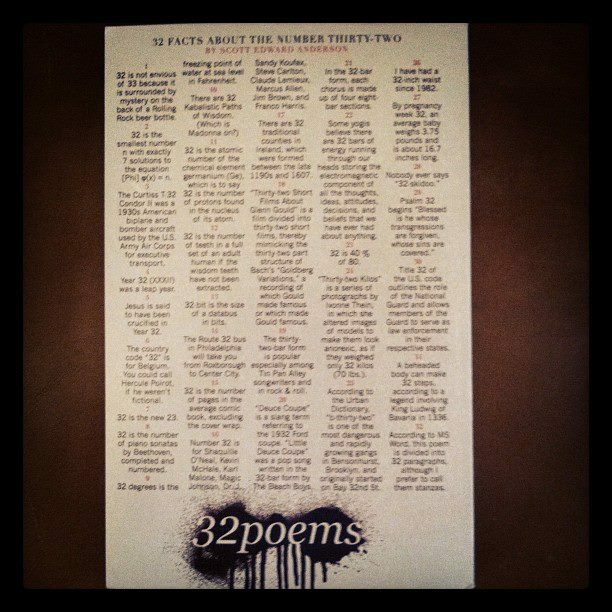 “32 Facts About the Number Thirty Two” as it appears on the back of 32 Poems magazine. Twitter is a great place for poetry. Not only is the short form of the messages (140 characters or less) conducive to the concision of the poetic craft, but the platform allows for the growth of connections and a network of poets in what is otherwise a lonely pursuit. Twitter also allows for easier connections between writers and literary magazines. Among the more active journals on Twitter is 32 Poems. Edited and published by poet Deborah Ager out of Hyattsville, MD, @32Poems is also is the host of the weekly “Poet Party” (#poetparty), which takes place Sunday nights (9-10 PM ET) on Twitter. Some time ago, then associate editor Caroline Crew issued a challenge to fellow poet Twitter followers to use the number 32 in a poem. At the prompting of Richard Fenwick, another poet I’ve gotten to know through the medium, I took up the challenge and wrote a poem called “32 Facts About the Number Thirty-Two.” The poem was published on the back of the Fall/Winter 2011 issue of 32 Poems (see photo at left). 1.) 32 is not envious of 33 because it is surrounded by mystery on the back of a Rolling Rock beer bottle. 2.) 32 is the smallest number n with exactly 7 solutions to the equation [Phi] φ(x) = n. 3.) The Curtiss T-32 Condor II was a 1930s American biplane and bomber aircraft used by the U.S. Army Air Corps for executive transport. 4.) Year 32 (XXXII) was a leap year. 5.) Jesus is said to have been crucified in Year 32. 7.) 32 is the new 23. 8.) 32 is the number of piano sonatas by Beethoven, completed and numbered. 9.) 32 degrees is the freezing point of water at sea level in Fahrenheit. 11.) 32 is the atomic number of the chemical element germanium (Ge), which is to say 32 is the number of protons found in the nucleus of its atom. 12.) 32 is the number of teeth in a full set of an adult human if the wisdom teeth have not been extracted. 13.) 32-bit is the size of a databus in bits. 14.) The Route 32 bus in Philadelphia will take you from Roxborough to CenterCity. 15.) 32 is the number of pages in the average comic book, excluding the cover wrap. 16.) Number 32 is for Shaquille O’Neal, Kevin McHale, Karl Malone, Magic Johnson, Dr. J, Sandy Koufax, Steve Carlton, Claude Lemieux, Marcus Allen, Jim Brown, and Franco Harris. 17.) There are 32 traditional counties in Ireland, which were formed between the late 1190s and 1607. 18.) “Thirty-two Short Films About Glenn Gould” is a film divided into thirty-two short films, thereby mimicking the thirty-two part structure of Bach’s “Goldberg Variations,” a recording of which Gould made famous or which made Gould famous. 19.) The thirty-two-bar form is popular especially among Tin Pan Alley songwriters and in rock & roll. 20.) “Deuce Coupe” is a slang term referring to the 1932 Ford coupe. “Little Deuce Coupe” was a pop song written in the 32-bar form by The Beach Boys. 21.) In the 32-bar form, each chorus is made up of four eight-bar sections. 22.) Some yogis believe there are 32 bars of energy running through our heads storing the electromagnetic component of all the thoughts, ideas, attitudes, decisions, and beliefs that we have ever had about anything. 23.) 32 is 40 % of 80. 24.) “Thirty-two Kilos” is a series of photographs by Ivonne Thein, in which she altered images of models to make them look anorexic, as if they weighed only 32 kilos (70 lbs.). 25.) According to the Urban Dictionary, “b-thirty-two” is one of the most dangerous and rapidly growing gangs in Bensonhurst,Brooklyn, and originally started on Bay 32nd St. 26.) I have had a 32-inch waist since 1982. 27.) By pregnancy week 32, an average baby weighs 3.75 pounds and is about 16.7 inches long. 30.) Title 32 of the U.S. code outlines the role of the National Guard and allows members of the Guard to serve as law enforcement in their respective states. 31.) A beheaded body can make 32 steps, according to a legend involving King Ludwig of Bavaria in 1336. 32.) According to Microsoft Word, this poem is divided into 32 paragraphs, although I prefer to call them stanzas.